The start of the annual Susan G. Komen Race for the Cure. 1. Give to legit charities — Only donations to qualified charitable organizations are tax-deductible, this includes gifts of cash, stock, real property or cars. All gifts must be itemized and substantiated on your tax return, so be sure to get a charitable receipt acknowledgement when you donate and keep your bank records, cancelled checks and credit card statements as a backup. 2. Do your homework — If you are unsure about the organization’s charitable status, check with Charity Navigator or search the IRS website. Also, take some time to review the organization’s website and annual report to make certain your money is directly making an impact. 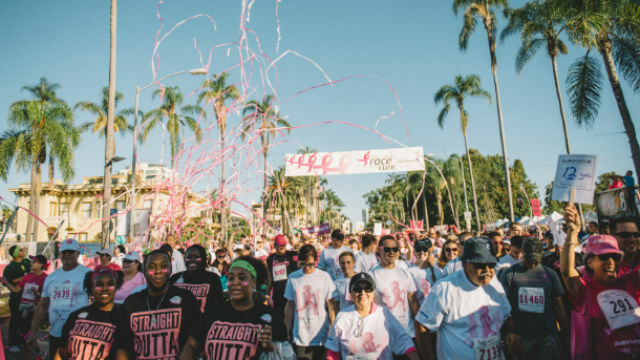 At Susan G. Komen San Diego, for example, we make every penny count. In fact, every dollar is earmarked to treating and curing breast cancer. 3. Get involved — Make sure you feel connected to the organization you decide to donate to by volunteering, taking a tour of their offices or attending an event so you see firsthand how the organization is making a difference. 4. Small gifts can make a BIG difference — Just starting your career? It’s okay to start small. Try making a small cash donation or sign up for monthly giving. Monthly giving is a great way to try out a charity and see if it is a good fit. Each month the amount you designate will be automatically processed. It is a quick and meaningful way to help! 5. Explore Planned Gifts — This is one of the easiest ways to give without impacting your financial portfolio in your lifetime. By including an organization in your will or living trust, you are leaving a legacy of hope without affecting your cash flow today. You can include a simple bequest with a stated amount or a more detailed bequest with a percentage of your estate. You can also make the charitable organization the named beneficiary of your life insurance or give a portion of your retirement assets. Be sure to let the organization know you have included them in your estate plans so you can be thanked properly in your lifetime. 6. Did you know? — If you are age 70½ or older you can take advantage of your Qualified Charitable Distribution from your IRA? In legislation enacted at the end of 2015, Congress made the QCD option permanent. You can transfer gifts of up to $100,000 annually directly from your IRA to a qualified charitable organization. This type of gift can make an immediate impact for an organization and for you too as no tax is generated on the minimum distribution you are required to take. 7. There are so many ways to give — Gifts of outright cash, appreciated assets like stocks, or real property are always great options to assist a charitable organization and a benefit you come tax time. Each type of gift provides charitable tax deductions and/or the alleviation of the payment of taxable gains on the appreciated value of the stocks or real property. For more detailed information on tax benefits of charitable giving or estate planning, please seek the assistance of your financial professional or tax accountant. On behalf of Susan G. Komen San Diego, I would like to acknowledge each and every one of our generous donors who have supported us in 2016. Thank you for giving the gift of hope. We wish you and your family a very happy holiday season and a prosperous new year! Judi Steadman is the director of individual & planned giving for Susan G. Komen San Diego, the county’s largest funder of free breast cancer services and support.